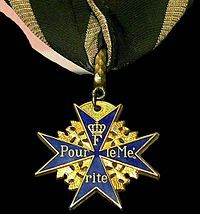 On January 12 of 1916, as the First World War was the process of tearing European civilization apart physically and morally, Oswald Boelcke and Max Immelmann became the first airmen to receive the most prestigious Imperial German military award, the Pour le Mérite, for eight victories each over Allied fliers. It might seem to acknowledge only the growing prominence of a new way for men to kill one another. But to me it embodies a certain poignancy about the world in the process of vanishing into the much and mire of the Western front. As you doubtless noticed with at least some curiosity, in the middle of a ferocious German effort to conquer France, the award in question has a French name. In fact the Pour le Mérite was by then nearly two centuries hold, having been inaugurated by Frederick II of Prussia in 1740. (It was also, for much of its history, also a civilian award though after 1842 in a separate class.) And he chose a French name not only because France was then a more dominant nation culturally as well as militarily than it later became, but also because divisions of nationality were regarded as less important and indeed less divisive in those days. Europe, for all its brutal wars, tyrannical governments and various stupidities, still saw itself as a unified civilization, specifically as "Christendom," one bound together by common ideals and habits however short they often fell in practice, and one in which common languages served to unite them, Latin in the Middle Ages and French to a large degree since. Both Boelcke and Immelmann deserved the award. The former was a brilliant pilot and tactician who trained the "Red Baron," Manfred von Richthofen, who idealized his mentor long after surpassing him in kills. And the latter invented an aerial combat maneuver still known as the "Immelmann turn" and in fact the Pour le Mérite came to be known informally as the "Blue Max in his honor. I salute their prowess while wishing they had fought in a better cause. Tragically the war in which they won this award left little room for such sentiments as the world grew crueler, harsher and less decent. The Great War took a terrible toll in lives, including Immelmann’s own just months later, on June 18, 1916 and then Boelcke’s on October 28; after being grounded for a month to spare the German public the loss of two such heroes in short order, he resumed his duties and died in a midair mid-combat collision with a fellow German plane. And it took at least as terrible a toll in ideals of the sort that once made it possible for the Kaiser to give a military award with a French name. The last such award was made on September 2, 1918. Perhaps this verdict is too bleak. The civil version was revived in 1923 in a mixture of French and German, the Pour le mérite für Wissenschaften und Künste. And after the dreadful Nazi period, it was again re-established in 1952 and is still awarded, not just as a medal but as an order with actual members.